How to Draw a Wolf. A realistic animal can be one of the most challenging subjects to draw. The same concepts in drawing are always utilized, no matter how complex the drawing is. Beginners can draw a wolf using just basic shapes, by following the steps below. 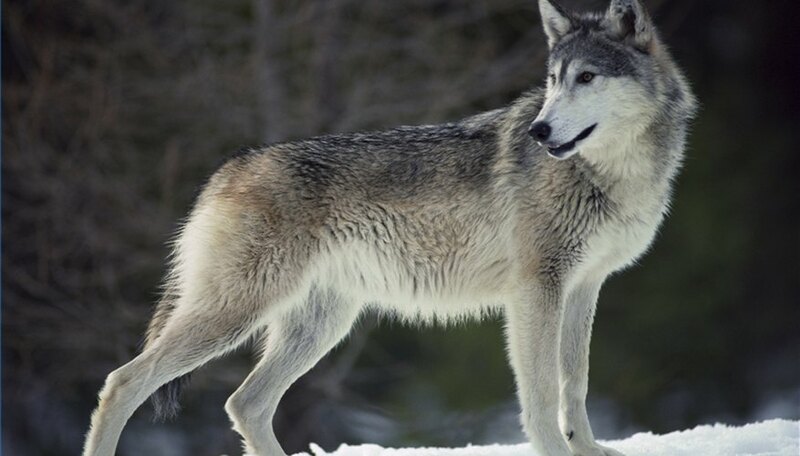 The wolf will be depicted in a side view with ears back and mouth open in a howl. Draw a large oval shape. This will be the body of the wolf, not including the legs or neck. The length of the oval should be one and a half times the height. Sketch a rough smaller circle up and to the right of the large oval. This will represent the head. Draw two slightly curved lines to connect the underside of the head, or circle to the chest or right underside of the large oval, and the top of the head to the back or top of the oval in the middle. Draw a curvy M shape at the front of the head for the open mouth, and one small ear pointed to the back of the animal. Sketch one curved back leg, and one curved front leg. These wolf legs on the side of the picture being viewed. Add a bushy tail hanging down behind the back of the animal. Add details such as a tiny nose, a slanted little line to indicate a closed eye and the inside of the visible ear. Finish by shading the edges of the animal, the inside of the mouth, the top of the head and under the belly. Make the tail look furry and bushy.